Great-Grandma Harbaugh (GGH) had a lot of aprons; some she made and wore, some we think her mother owned (that is saying something, too), some we think where just gifts or that she found junking or just purchased at the store. Not sure which are which. My in-laws plan on distributing them to the grandchildren on all sides of the family I think come Labor Day. 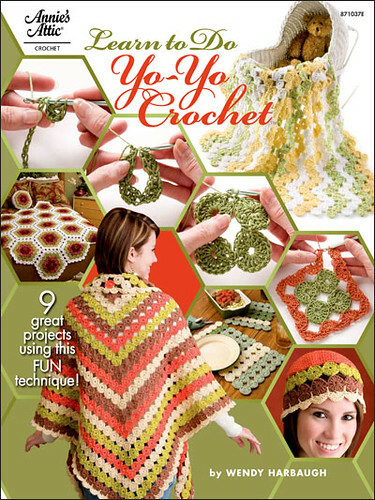 Till then, they are in my possession; just on loan so I can try to make patterns from them for future use. Also so they can all be seen as one collection before being distributed throughout the family. So, I am going to try and post an apron a day, minus Sundays, till I get through all of them. If we find more later down the road, I will add them at that time. There are about 30 of them at the moment. 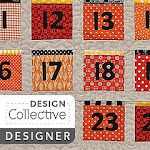 I am posting a topic on the side bar called GGH aprons so if people just want to see the collection they can as the aprons get posted; this will also to make it easier for family to find them, as well. They are all different styles; some with chicken scratch, embroidery, plastic, utilitarian, Sunday best, and so on. 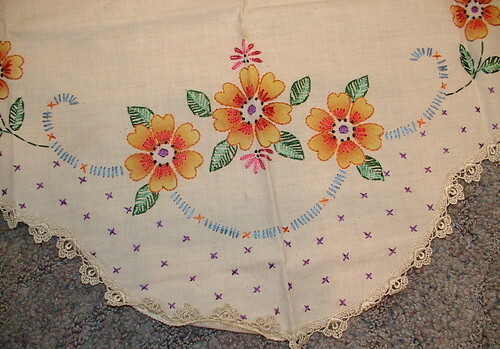 This one has embroidery and lace and even some hand painting on the petals of the flowers. (None of these aprons are cleaned or pressed; pictures taken straight as they came from the drawers they had been stored in.) Since they are not mine, I do not want to possibly do something to them that may damage them in any way. So the pictures with show age and wrinkles just like we all do in time. 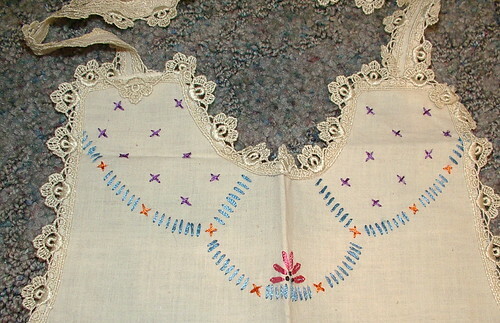 Bib section with embroidery and lace. 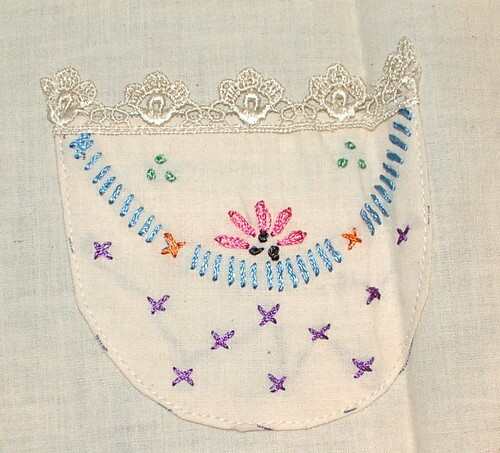 Pocket section of apron; two pockets on this apron, so pretty. Here you can see the painting on the large petals of the flowers. Not sure if that was done first or second, meaning before or after the embroidery. We are trying to date these; so far I think this one is 1910- 1920 because of the style of apron. Probably late 1920's, close to 1930; I have seen a similar pattern dated 1928. Update in the process of drafting a pattern from this one I discovered it was a pre-printed pattern. Meaning it was stamped with the pattern to be embroidered on it. If any one knows of this kit and has the old number I would greatly appreciate adding it to this post for family reference. 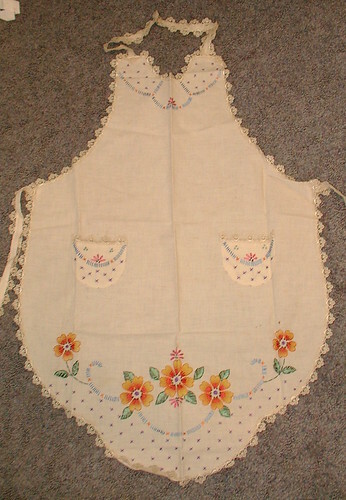 What a simply beautiful apron - you are so lucky to have an apron collection! These aprons are absolute amazing! This one should be framed in a shadow box and displayed as the work of art it is. I'd guess it's from the Twenties. Fabbo!